If you find an unnecessary duplicate PST file in Outlook that appears in the form of archives then you may want to get rid of it to avoid confusion. When you try to delete such a file or folder you may get an error that says “There was an error. Object was not found”. To get rid of it you can use a small tool known as CodeTwo PST Ghostbuster. How to delete/ remove duplicate PST file in Outlook? Firstly, download CodeTwo PST Ghostbuster and install it. 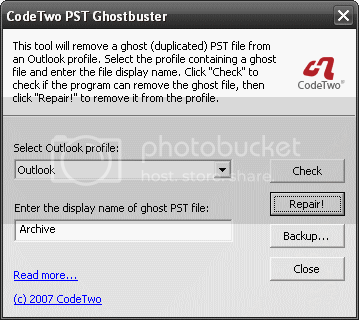 Now, start CodeTwo PST Ghostbuster and select Outlook profile with duplicate PST issue. Enter the name of the duplicate file in the box below drop down box. Click Check button to verify if entered file is duplicate or not. Now, If you get the message “Invalid sections that should be removed were found”, then specified file in duplicate, simply click on Repair button to delete specific duplicate PST file.